Infrastructure Development Projects - Politics, News, and Hypocrisy - Chickensomething What Are You Afraid Of? Perhaps our infrastructure should be a bigger priority than who we are going to bomb next, or what new weapon we can build. The railroads get government subsidies and tax concessions out the ying yang. So does Amtrak which uses CSX lines to transport people. So whether or not the lines are privately owned, our tax dollars fund it to a degree one way or another. And if we are going to spend money on something, our infrastructure is a good place to start. A century of living anywhere causes serious wear and tear. That goes double for a town as busy and rough as this one, though. Over time, New York has grown up around, under, and above itself with more buildings, trains, and skyscrapers. Along the way, we have picked up a laundry list of decaying pipes, crumbling buildings, squalid subway stations and tunnels, rotting pier pilings, and often roughshod streets. I've noticed a buildup of new stores and outlets around town. More chains and franchises than anything. Auto parts, dollar stores, cheap food marts, etc. The roads around town need some repair. Our bridges look ok and the drainage systems are pretty clear. After the hurricane a few years ago they made sure of that. The buildup of the infrastructure could be occuring in other ways. Ways in which a society governs itself. Certain attitudes and access to educational standards are building in such a way as to diminish the quality of any human value for the future. The media keeps spilling its own build up of the pressure to expode by reporting only negative standard news. Nothing positive to sell the American people on to re-build the nation. Trump says he wants to rebuild the nation. Re-build it into what? A new report commissioned by Australasian Corrosion Association (ACA) examines the economic impact of corrosion, estimating the degradation of infrastructure and assets caused by corrosion at 3 to 5 per cent of GDP each year. This represents an annual cost of many billions of dollars to the Australian and New Zealand economies. 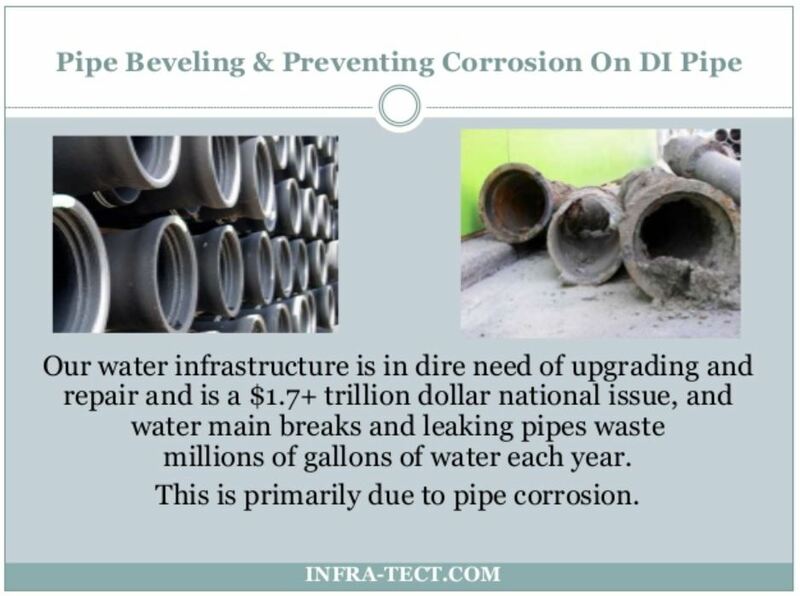 An epidemic of corrosion...pipe failures! Talk about stone age behavior! Ya'll realize this is all only part of the problem. Water is only one factor in the equation of life and death we all face...but, it's the most important for everyone! Does the current mentality of corporate infrastructure offer a way to restore the power to the people to work out community problems for themselves? Do these entities offer support to the communities in which they do business?